***Disclosure-Sample product was received. All opinions are based on my own personal experience. I could not tell you what Kaijudo was or how to pronounce it but when my 14 year old opened the package containing this DVD he knew exactly what it was. 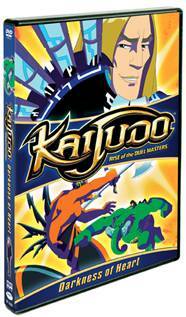 Kaijudo is one of my son's favorite series. It just happens to be about a 14 year old too. It is an action-fantasy animated series. A story about Ray, a young hero, and his adventures with the Duel Masters. Produced by Hasbro Studios and Wizards of the Coast, KAIJUDO: Rise of the Duel Masters: Darkness of Heart features the voice talent of popular actors Scott Wolf, Freddy Rodriguez, John DiMaggio, Oded Fehr, Phil LaMarr, David Sobolov, Kari Wahlgren and Jason Marsden. This is a must have for your teen duelists, and collectors. Recommended for all ages. The collectible DVD is being release nationwide September 24, 2013 and is priced at $14.97.